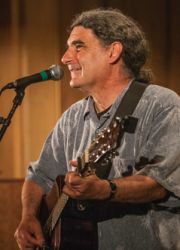 Singer/Songwriter/Comedy Storyteller Don White is from Lynn, Massachusetts, “a working class town with an attitude problem”. If you didn’t already know that, he would have let you know when you saw him at Moisture Festival this year. Don can’t help but share with you who he is and what’s going on with him. Yeah, he’s got some songs, some truly wonderful songs that deliver their truth with disarming humor and genuine heart … but when Don White travels to your town you get more than his songs, he’ll reach down deep to tell you about himself, his town, his family, his life. Apparently, the telling takes him home. This is Don’s first time with Moisture Festival and if it’s your first time seeing him live, you’re in for a treat but I advise you to do what I did and check out his website (click on the sign beneath his photo), his tunes and the several hilarious videos. If you’re like me you’ll go on to YouTube looking for and finding more of his tales. Enjoy!